Petition: DEMAND A HARSHER PUNISHMENT for the Farmer, 55, who HANGED his sheepdog Prince from a tree because he didn't round up his flock properly. DEMAND A HARSHER PUNISHMENT for the Farmer, 55, who HANGED his sheepdog Prince from a tree because he didn't round up his flock properly. Graham Thomas, 55, attached a piece of 20ft rope around Prince's neck and hanged him from a large tree on his farm in South Wales. 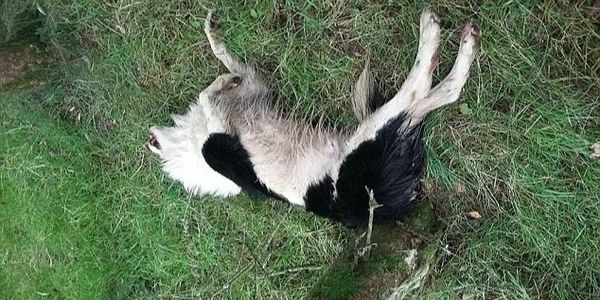 Witnesses described seeing Thomas shouting and swearing at the Welsh border collie in the moments before he was killed. Thomas pleaded not guilty and claimed the black and white hound had managed to climb up the sapling himself while twisting the rope around his neck in the process. He claimed Prince was dead by the time he tried to help at the farm in Rhymney, South Wales. The jury at Newport Magistrates' Court did not fall for his story however, finding him guilty following a trial this week. Newport Magistrates Court heard that the RSPCA spoke to an expert vet who said that Thomas' story didn't add up. Thomas, of Tredegar, Blaenau Gwent, South Wales, denied the offence under the Animal Welfare Act, but was found guilty after trial. The court heard that it was one of the 'clearest' acts of cruelty that had been encountered and was so serious that only custody could be justified. He was jailed for 18 weeks for causing unnecessary suffering. He was banned from keeping dogs and sheep for life. RSPCA inspector Emma Smith said: 'This is such an unusual and disturbing case where a sheepdog was killed by his owner allegedly because he wouldn't round up his sheep properly. 'Prince would have suffered immensely which resulted sadly in his death. This deliberate cruelty is just so horrific to fathom. Following the incident his body was then removed by the defendant and burnt.